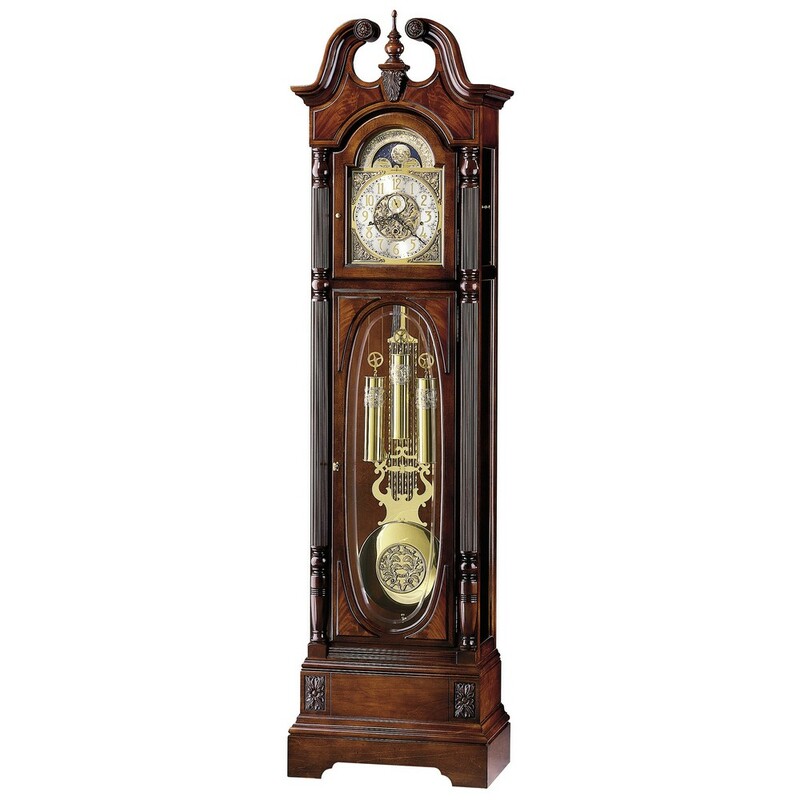 The beauty of the Stewart Grandfather Clock is enhanced by an elegant swan neck pediment accented with decorative rosettes and matching keystone finial support, a turned finial, and crotch-figured mahogany. The crotch-figured mahogany continues on the top and bottom corners of the door that features crystal-cut, V-groove and oval glass. A multi-tiered base is accented by complimenting overlays and supports reeded columns with turned column caps. 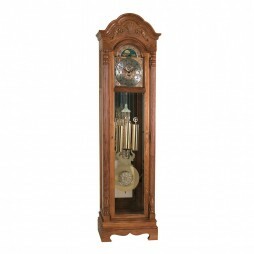 The clock is finished in a Windsor Cherry stain over select hardwoods and veneers. Elaborate corner spandrels and center disc heighten the charm of the special cast dial with an astrological blue moon phase. An illuminated case highlights the brass pendulum and weights that feature a decorative cast pendulum bob and matching weight bands. Enjoy the concerto movement that plays Westminster chime, Shubert's “Ave Maria” and Beethoven's “Ode to Joy”. The clock features an automatic nighttime chime shut-off option and locking door for added security. You will receive a heirloom plate, engraved with name and date, by returning the enclosed request card to Howard Miller. Expressions of Time is an authorized Howard Miller dealer. 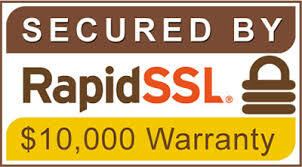 This means you’ll receive an authentic Howard Miller clock, covered by the two year manufacturer’s warranty. 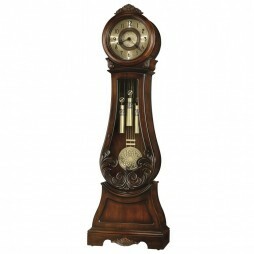 The very essence of intricate, enthralling and elaborate design, the Ridgeway Holland Grandfather Clock is the ideal house hold item for bringing a hint of traditional style to its surroundings. 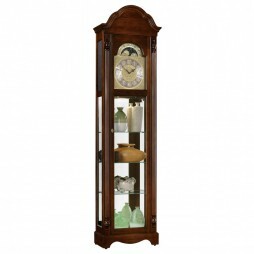 This clock comes with a slender case designed with a gently curved solid bonnet, a graceful shell and leaf overlay, reeded columns, covered in a Treasure Oak finish. It has also been fitted with a decorated brass colored face with a silver chapter ring, matching brass weights and a lyre shaped pendulum, which are visible through the beveled glass of its front door. The grandfather clock also comes with a cable driven movement and an automatic night silence option. 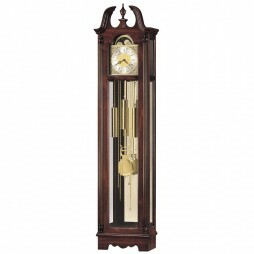 The Diana Grandfather Clock is a classic beauty. Constructed from select hardwoods and veneers and finished in Embassy Cherry, the shapely design is highlighted by the carved leaf accent designs and the heavily carved leaf design in the lower door. The bomb style base features and inset panel with a unique shell overlay gracing the cutout. Satin black Arabic numerals enhance the distinctive dial featuring a crystal-cut center disk framed by a decorative wood ring to match the cabinet, and a circular spun brass-tone chapter ring. The face of the dial is illuminated, adding a warm glow to the interior of the cabinet and highlighting the pendulum and weight shells. The case is illuminated by an interior light and features a locking door for added security. Adjustable corner levelers provide stability on carpeted or uneven floors. An heirloom Record Certificate with capsule is included for recording your clock's history for future generations. Upon returning the enclosed request card to Howard Miller, you will receive a heirloom plate, engraved with the name and date.